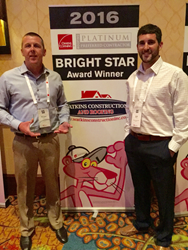 Watkins Construction was among a distinguished group of Owens Corning Roofing Platinum Preferred Contractors honored for outstanding achievement and exemplary business practices during the 2016 Owens Corning Roofing Platinum Awards ceremony. The annual industry celebration, hosted by Owens Corning Roofing and Asphalt, awards the country’s top roofing contractor businesses for marketleading performance and innovation. For additional information on the Owens Corning Roofing Platinum Preferred Contractor Network, visit Owens Corning Roofing Platinum Preferred Contractors The Owens Corning Roofing Platinum Preferred Contractor Network is considered one of the industry’s most exclusive customer reward and loyalty programs. To become a member, contractors must first meet a set of criteria to be accepted into the network. Those who are accepted into the program gain exclusive advantages, including deeper business relationships that allow for the development of innovative products for customers, sales programs and enhanced marketing tools.